Lensatic: Don't Believe the Hype! Kristin Thompson at Observations on Film Art assesses the so-called Hollywood slump and finds that reports have been slightly exaggerated. "[A]t the end of 2011, the press was trumpeting the fact that the film industry was suffering a slump that might become permanent. After all, “the movies are in a slump!” makes for more catchy copy than “the movies have sunk back to normal” or “the movies are in a downturn from which they will probably recover.” The Hollywood Reporter went for a particularly dramatic approach to year-end coverage of the slump, as evidenced by the title/illustration (see above) of Pamela McClintock’s analysis, appearing in the January 13, 2012 print issue and online." "McClintock cited a number of factors. Young people are no longer going to the movie theaters. The studios are too dependent on big, familiar franchise pictures: “But exhibitors worry that moviegoers are growing impatient with Hollywood’s love affair with the familiar and shortage of original ideas (hello, Avatar!). In 2011, for the first time ever, all of the 10 top-grossing films domestically were franchise titles and spinoffs.” (But wouldn’t that mean that moviegoers are more than ever thrilled with Hollywood’s franchises?) She cites also the rise in admission costs, with ticket prices going up by 5% from 2009 to 2010." BUT, don't believe the hype... the good news is that the movie industry is NOT in a slump. "One might conclude from all the stories about the box-office slump of 2011 that the big studios’ profits would be down, at least a little. Actually, a studio had to work hard not to see profits rise last year. That’s partly because they make things other than movies and partly because movies make a lot of money that has no direct connection with theatrical distribution." "The February 24, 2012 issue of The Hollywood Reporter published a helpful summary, “2011 Profitability: Studio vs. Studio.” (The online version is behind a paywall.) As the authors point out, the studios calculated their profitability on different criteria, so direct comparisons among them are difficult. Nevertheless, the article shows that most studios were profitable and suggests why." But all is not clear on the western front because there is bad news. 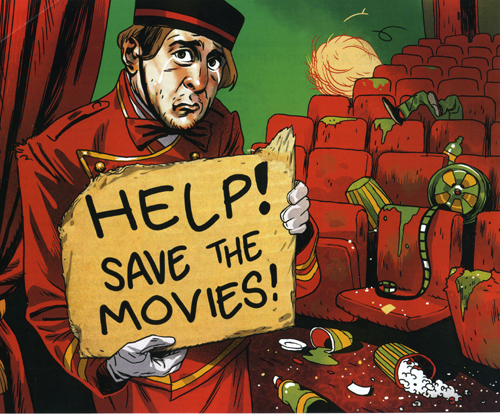 "[T]he real crisis facing the film industry today is not fluctuations in box-office income. It’s how to deal with the rapidly changing post-theatrical revenue stream: the sudden proliferation of other ways to sell or rent films for viewing on the tablets, game consoles, cell phones, computers, and other devices now driving the death of tape- or disc-based home entertainment. Studios see new ways to make money and are at war with exhibitors about how short a window there would be between theatrical release and the various forms of video release." "The moral is, the obvious interpretation is not always the correct one. The implication of box-office fluctuations needs analysis beyond a simple comparison of ups and downs from one year to the next." Or maybe news of a slump has the psychological effect of guilting people into going to the movies out of brand loyalty.